Avaza Projects lets you manage both internal and customer projects in one place. Avaza is great for businesses of all types – your projects can be big or small, have one or more team members working on them, and use all or just some of the features Avaza offers. Projects are broken down into sections and tasks allowing team members to collaborate and organize their work under one roof. Tasks each have their own email-enabled discussion history, so you can centrally track your team & customer discussions on task. You can plan your project out with our optional resource scheduling module. This will allow you to assign work based on user availability as well as forecast cost and billable amounts. To help manage costs you can set project budgets, record expenses and track timesheets against the project and tasks. If you’re charging a customer for your work, you have the flexibility to charge fixed amounts as work is completed and/or set time-based billable rates. Billable rates can be set for each team member or category of work. Similarly, expense categories can be set up as billable or non-billable and optionally with fixed and percentage based default markups to use when invoicing. Whenever you create an Invoice for a customer, you can add billable Timesheets, Fixed Amounts, and Expenses to the invoice. You can even give your clients the convenience & flexibility to pay you online via Paypal, Payoneer or a credit card (via Stripe). Avaza has numerous powerful reports available to help you understand and improve your business. For example, reports to monitor project progress, track budgets, resource utilization & project profitability. Let’s dive into Projects, and how you can quickly get started with Avaza. Most teams work on more than one project at the same time. To view all projects, including archived ones, click on “View All Projects” in the Projects module. This page shows all current projects grouped by Customer with project status (Not Started, In Progress and Complete) and assigned Project Tags/Categories. All visible fields (customer name, project titles, tags, and categories) can be used in the Search field to display relevant projects. This list also provides an overview of the number of completed vs total tasks in each project, an option to archive the project or go to the project settings page. You can also use this window to create a new project or view all archived projects. Projects can be archived and un-archived at any time. Archived projects don’t count against project quota limits and are useful for keeping your active project list to a manageable size. You can also use the Archived Projects screen to delete projects using the 3-dot control. Ready to get started? Let’s create your first project. When creating a project, you can link it to a new or existing Customer. If you’re creating a project for internal purposes, we suggest creating a Customer called “Internal”. If all project members need their timesheets approved, you can check off the “Require timesheet approvals by default” setting so all timesheet users added to the project automatically require approval for their timesheets. Avaza also allows you to use a previous project as a template. 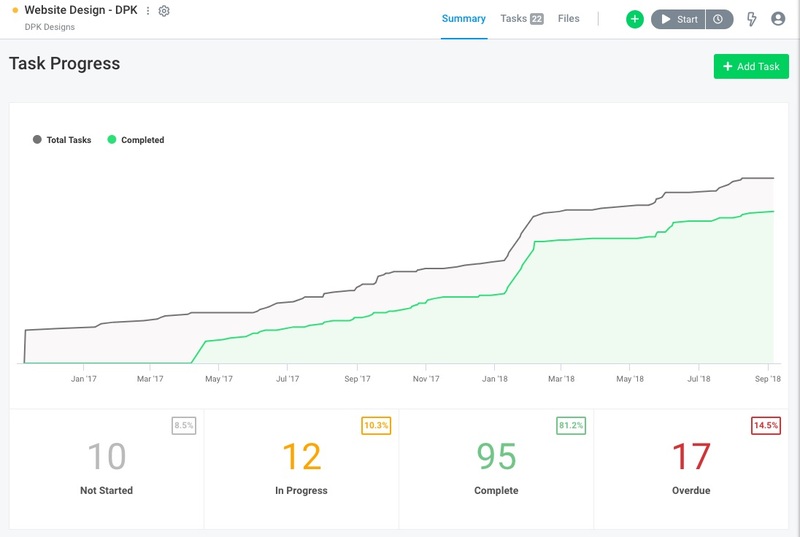 This feature copies all sections and tasks from the existing project, resetting task status to Not Started, and also allowing you to choose a variety of additional settings & data to be copied across. Many teams find this useful when they have similar projects for different, or even the same, customer. Avaza Projects have powerful & flexible visualization options for your tasks. There are multiple Views, as well as Grouping and Filtering options you can toggle to suit the work at hand. (for example, if you grouping by Assigned To, you can quickly re-assign tasks by dragging them between groups). 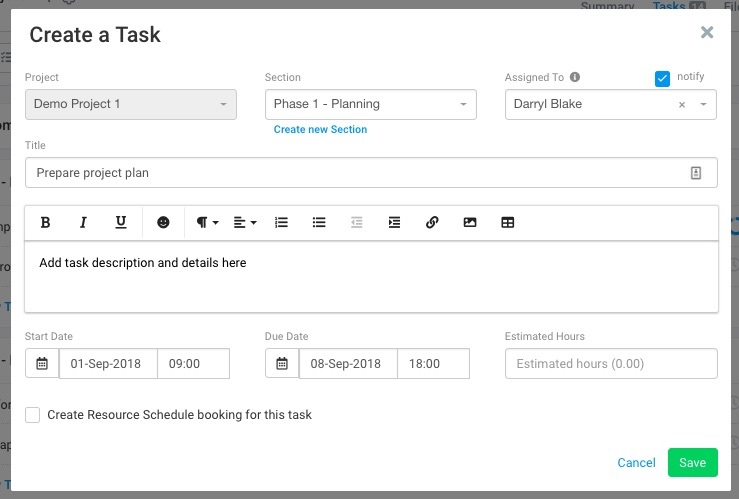 The three main layout views are List-view, where all the tasks are displayed in a list, the side-by-side view which shows all tasks as cards on a Kanban-style board or a Gantt Chart that support task dependencies and auto-scheduling of task start and end times. Avaza projects are flexible and powerful. Use Sections to group related Tasks together. Sections are really useful for representing stages of a project, milestones, different mini-projects within the project, etc. Sections can be renamed by clicking on the section header and re-ordered using the drag/drop function. Sections can also be collapsed, either one by one or all at once using the collapse button. This button is found next to the 3-dot control on each Section Header (to collapse one section at a time) and on the Main Project Navigation next to the Filter button (to collapse and expand all sections). You can create tasks for yourself or your team members. Tasks can have due dates, attachments, tags, and can also be discussed online & via email. They can be broken down into subtasks, so that work becomes more manageable. Schedule assignments can be linked to tasks as well. Our Task Management Guide runs you through task creation, management, and collaboration in more detail. Files can also be uploaded and attached to Projects, Tasks and Task Discussions. There is also a centralized Files view on each project where all files uploaded across the project can be browsed, filtered and searched across grid and list views. Our File Management Guide covers everything you need to know about managing your files in Avaza. Get a quick overview of task status for a particular project, as well as the rate at which tasks are being completed versus the total number of tasks on the Summary tab. These stats and graphs (shown below) can also help you quickly ascertain projects that might be in danger of not getting completed on time. The Task Progress graph shows stats for tasks not yet started, in-progress, completed and overdue. These statistics are clickable and are shortcuts to filtering your task list to display tasks in each status. You can drag-select date ranges on the chart to view a zoomed-in view. Your team and customer contacts can be added to a project to collaborate on tasks, track time and expenses. a) Via the Contacts screen, invite them to Avaza and ensure they are assigned the “Project Collaborator” role. b) Check “Add to all New Projects” and/or “Add to Existing Projects” to add them to appropriate projects automatically. You can also add them to specific projects. You can also invite existing team members to a project via the Project Settings page, or create a new user at the time. The Avaza Contacts Guide takes you through global user roles, permissions and more. Every project has a set of settings where you enter project notes, manage budgets, team members, billable rates, timesheet approvals etc. The settings cog is located right next to the Project Title. Only users with Admin, Invoice Manager and account-level Project Manager permissions can access the project-specific settings. 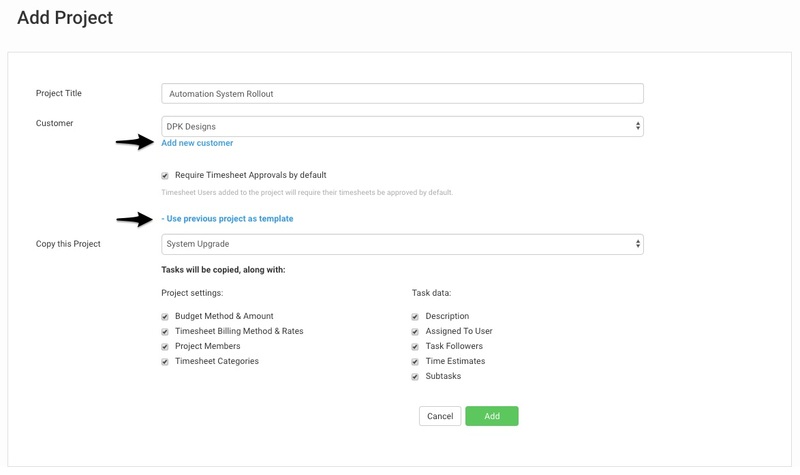 Our Project Settings Guide runs you through all the project settings you can tinker with, as well as billable rates and project budget settings. Our Project Settings Guide provides an overview of the various approaches for billing customers in Avaza. Our Project Reporting Guide walks you through some of the key reports that will help you manage your projects & people and provide insight to support your decision making. Hope this guide helps you understand how to create and manage projects in Avaza. If you need further help, feel free to contact our support team via chat or by emailing support@avaza.com.